More rain! At least right now. Most of the day we had no rain. We fell asleep last night to rain falling on the tent. We awoke to silence. Sometime in the night the wind stopped. We got on the trail at 9:00 am and hiked back up to Hannegan Pass. We stood around there and had a hiker moot. A moot is where you stand around and make decisions. The decision before us was "what did we want to do next?" We decided to make a second attempt to climb Ruth Mountain. 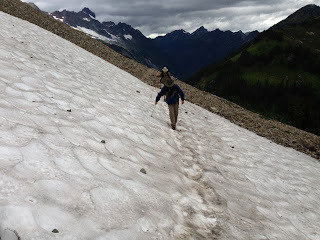 We spent the rest of the morning climbing up the ridge to the foot of the snow field. We tried to climb the snow but we really didn't have the right equipment so we decided to eat lunch at the border between the snow and the rocks. After lunch we headed to our camp at Silesia on Copper Ridge. The views from here are spectacular and we have a much better indicator of approaching weather - we can see the horizon. On our way down from Hannegan Pass we came to a cold rushing stream with bright sparkly water rushing down across the hard, barren scree slope at the bottom of a cliff. No algae on the sides of rocks, no plants, dirt, or other other indicators of organic material. 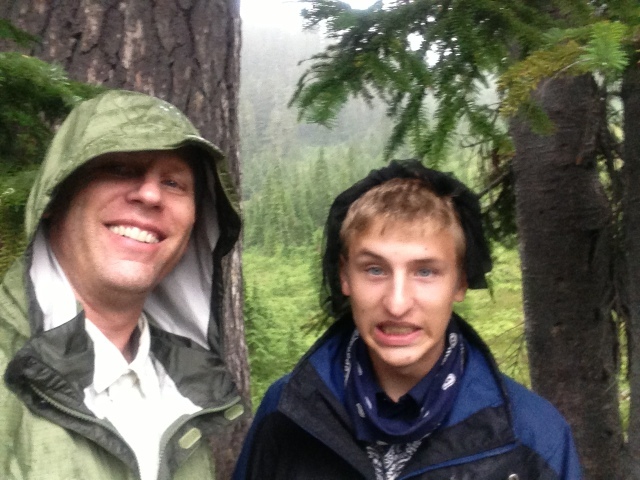 We filled our water bottles and as we sat waiting for the Aqua Mira we met a thru-hiker on the Pacific Northwest trail. She has started in Montana forty three days ago and still had four weeks of travel before reaching the end of the trail at the Pacific Ocean. We got a prime campsite here at Silesia, right on the top of the ridge. There are two campsites here. They are both on the top of the ridge. After setting up camp we had to get water. the big downside of Silesia is that it is a dry camp. The nearest water is at Egg Lake, it doesn't look that far away on the map but the trail is quite steep. A round trip there and back took about forty five minutes. When we finally got back we prepared dinner. We had the best seating ever for dinner, and the weather had cooperated all day so the views to the mountain peaks around us were clear and spectacular. We got everything cleaned and into our tent as the sun was setting. Within ten minutes of getting settled the rain started. It is raining quite hard, and the wind seems to be picking up too. I am glad that this storm didn't start earlier.